Can Management Predict Information Security Threats by Utilizing a Data Warehouse? In many organizations, management has the responsibility of implementing information security countermeasures to detect, minimize, and defend against information security threats. Most of these countermeasures traditionally adopt a passive approach to securing corporate data. 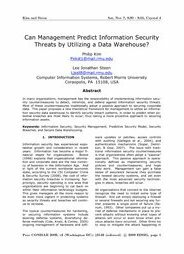 This paper proposes a new theoretical framework for management to utilize an information security data warehouse to identify security breach patterns, in order to predict when potential breaches are most likely to occur, thus taking a more proactive approach to securing information assets.